One of the most popular photographs I take on every couple’s wedding day is a shot of the bride and groom in their beautifully decorated ballroom just before the guests are ushered in for dining and dancing. To see their room decorated, the way their guests will see it when they arrive, is so important. All the little details that the bride and groom gave so much thought and consideration too will be preserved forever in an assortment of fine wedding photos. The linens they chose. The floral centerpieces that adorn each table. The wedding cake. Personalized champagne glasses. Menus. Favors. The decorative up-lighting. Everything. So many details will be quickly forgotten after the wedding day. Be sure to have a great wedding photographer capture them all for you. This picture was taken on the dance floor at The Watermill Inn in Smithtown, NY. The Watermill is owned by the same restaurant group that owns three more of Long Island’s most amazing catering venues: Chateau Briand in Westbury, New York; The Fox Hollow Inn in Woodbury, NY; and Westbury Manor. 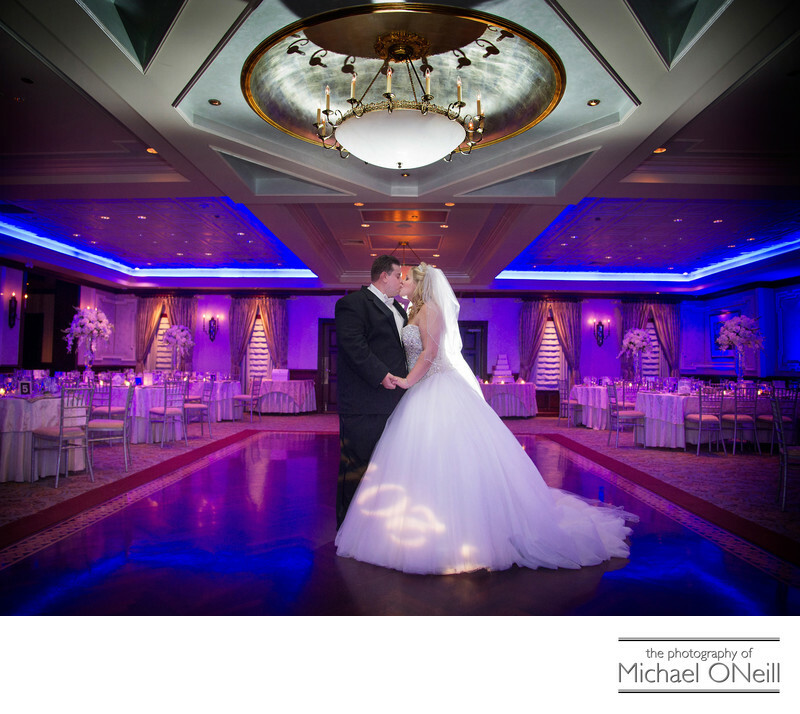 As a Long Island based wedding photographer I have worked at and garnered a great amount of experience at each of these Nassau and Suffolk County catering establishments. If you are planning a wedding at any of these fine Scotto Brothers locations I welcome the opportunity to discuss your photography plans and wishes for your wedding day.